I make these doughnuts for dessert during the week or for Shabbat and they come out delicious every time! 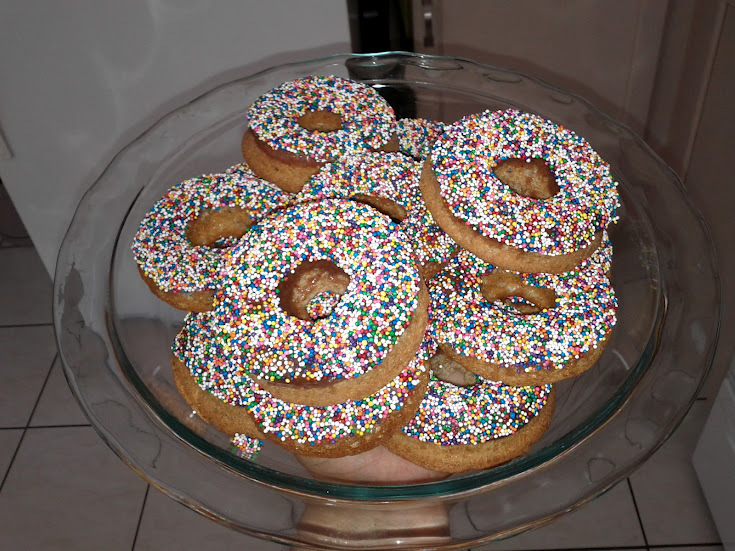 Super quick to make, great for kids, these doughnuts are actually good for you, they are dairy-free, wheat free (I use spelt flour instead of wheat) and the best part – they are NOT fried!! I would love to hear how they came out for you! 1. Preheat the oven to 325 degrees. Very lightly grease 2 nonstick doughnut pans. Do not over grease! 2. In a large bowl, whisk together 1/2 cup coconut milk, dairy-free yogurt, oil, eggs, and 2 teaspoons vanilla. Add sugar, and whist until smooth. Add flour, baking powder, salt, and nutmeg right into the liquids, and stir until combined. Neatly fill each doughnut cup in the prepared pans about 3/4 full, making sure the centre rise is kept clean. 3. bake uncovered for 12 minutes, until doughnuts spring back when touched. Allow doughnuts to cool for a few minutes before removing them from the pans. 4. In the meantime, prepare the glaze: In a medium bowl, whisk together organic confectioners’ sugar and cocoa. Stirring continually, slowly add remaining 1 teaspoon vanilla and remaining 1 1/2 tbsp milk to make a smooth dip-able glaze. 5. Working quickly while the glaze is still wet, dip one side of each doughnut into the glaze. 6. Arrange the doughnuts on a clean baking sheet and quickly sprinkle with coloured sprinkles while glaze is still moist. Allow glaze to set with sprinkles. Serve once doughnuts have completely cooled.